Bitter disappointment last night at the Beerhound residence as Japan were so narrowly defeated by Paraguay. The end – by penalties – was especially difficult to cope with, coming as it did after such a hard-fought battle. 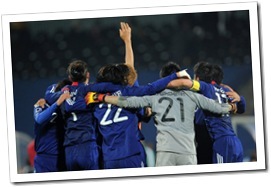 Japan came close to scoring a couple of times – one blinding strike rattling off the crossbar just inches from its target. But in the meantime, both I and Big M will be wearing our new Japan shirts with heads held high. Unlike England fans, of course, who I’m sure will be only to willing to try and put England’s humiliation behind them. How I feel sorry for anyone that got stitched-up purchasing the vastly overpriced England strip. Previous Post No explanation necessary….